We should not ask for any long-term provision. My pen froze in mid-air. What???? We should not ask for any long-term provision? My daughter came home and wrote the seven words on my office white board. She was struck by this concept too. 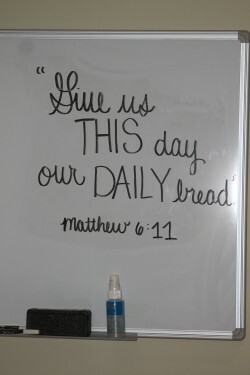 The next morning, I sat in my “quiet time” chair staring directly at my newly inscribed white board as I began to pray. In the shadow of these words, I closed my eyes and practiced something new. I only prayed for that day. I prayed for the bills to be paid that day. I thanked God for the meals He was providing that day. I thanked Him for the job I had that day. I prayed for my schedule in greater detail, asking God to intervene with His kingdom work in each situation. I have been practicing this for a few months now and I can say my “todays” are getting a lot more attention. When I move on to more important matters like peoples’ souls and circumstances in countries around the world, I pray for their todays as well. I am a few months away from that particular morning. 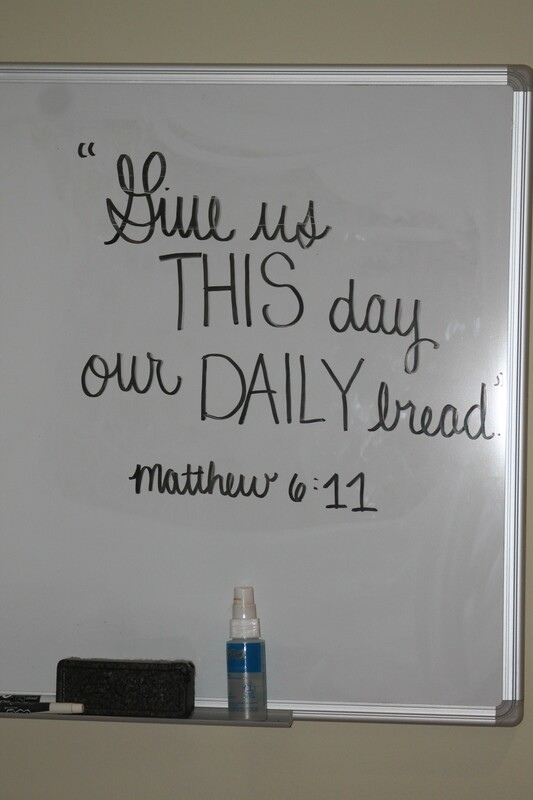 The words are still on my white board (I just took the picture.) I think Crawford may be right. What if today is not enough? Though I have made some strides in this area, I still fight the urge to pray for future security. I have decided it’s partly because today is not enough. Too often, I want more than what today has for me. I am not content. This discontent tempts me to think about, strive and pray for tomorrow. It divides my mind and heart, making it impossible to be fully present today. Philippians 4:13 is a verse I have seen applied to everything from quitting smoking, winning a ball game, and taking a test (maybe that wasn’t even studied for). Crawford taught me in another one of his messages that the context of this popular verse is contentment. Take a look. In Christ, I can be content with every “today”…with the clothes I have today, the car I have today, the bills that arrive, where I live and where I work. I can do all things through Christ who strengthens me. Deitrich Bonhoeffer said, Every morning is a new beginning of our life. Every day is a completed whole. It makes sense that if I live each day well, the faithful days will string together into months, years and decades of living well for God because I trusted Him for nothing more than one day at a time. So let’s all pull back the tent flap each morning and go gather the provision He has provided for today. After all, He has all of our tomorrows.